Marvel is quickly making many of their titles available in digital form. 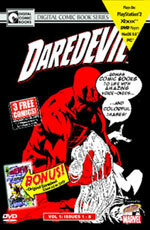 There are several ways you can now view or purchase Daredevil comics. These include Marvel's Digital Comics Unlimited, Sony's PlayStation Digital Comics, and ComiXology. If you'd like to see what issues are available, please check out the links below. Marvel's initiative costs $4.99 US/month (billed as $59.88 year) or $9.99 US/month. This gives access to all titles to view. Sony's Digital Comics can only be viewed on the PSP, and must be downloaded through the PlayStation Network (this is now discontinued). Each download ranges in cost (most seem to be $1.99 US). 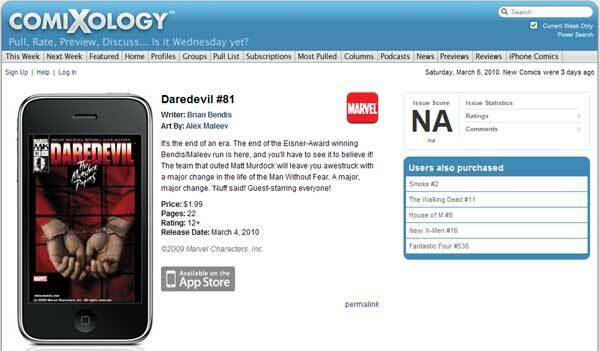 ComiXology's app is downloaded onto your iPhone/iPad/Android and comics are viewed on it. Please note: ComiXology's Marvel comics are now available internationally (originally was only US). 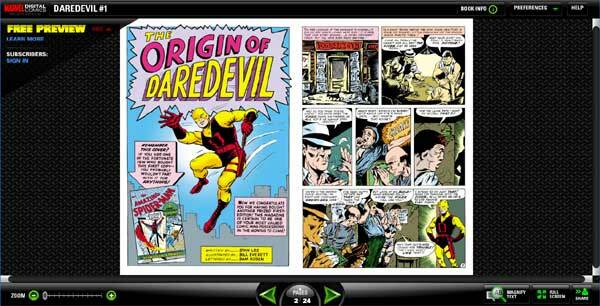 These comics are now available on the iPhone, iPad and Android. In late October 2013, it was announced that a new Infinite Comic would be produced to follow the "ending" of DAREDEVIL Vol. 3. Here was the press release from Marvel. More details to come! DAREDEVIL and Mark Waid go from PRINT to INFINITE COMICS! Fan-Favorite Series Continues for Digital-Only Infinite Comic Series! New York, NY -- October 31st, 2013 -- Gear up for a road trip unlike anything you've ever experienced as Matt Murdock heads west in Daredevil: Road Warrior -- the latest game-changing Infinite Comic hitting digital devices this February! Following other blockbuster Infinite Comic series like Wolverine: Japan's Most Wanted & Iron Man: Fatal Frontier, Daredevil: Road Warrior is designed specifically for mobile devices and fully embraces the technological opportunities -- while still staying true to the medium's greatest strengths! Acclaimed Daredevil writer Mark Waid teams with artist Peter Krause to take Matt Murdock on a brand new journey full of adventure, excitement, and more than a few dangers! Launching the week after Daredevil #36, the final issue of Waid's and artist Chris Samnee's award-winning series -- Daredevil: Road Warrior finds the Man Without Fear beginning his coast-to-coast journey from the Big Apple to sunny California! "Matt's beginning a whole new chapter in his life following the events of Daredevil #36, and he's excited but apprehensive at the same time," Waid said in an interview with Marvel.com. "You can be a Man Without Fear and still be a little worried about where the next paycheck is coming from. Daredevil: Road Warrior is a coast-to-coast adventure/chase with thrills aplenty." Is the west coast a new beginning for the Man Without Fear? Or can you take the crimefighter out of the city -- but never the city out of the crimefighter? Find out as Daredevil begins his grand journey this February in Daredevil: Road Warrior! Available right at your fingertips, these new Infinite Comics will be available for purchase this February on the Marvel Comics app (for iPhone®, iPad®, iPod Touch® & Android(TM) devices) and online in the Marvel Digital Comics Shop! Note, as of July 2011, the program for PSP has been cancelled. No new titles will be produced. This digital comic book came out in 2003, and features the whole Guardian Devil story on DVD, with voice actors. 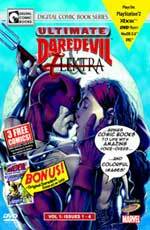 This digital comic book came out in 2003, and features the 4 issue limited series Ultimate Daredevil/Elektra, with voice actors.